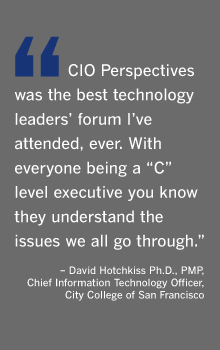 The CIO Perspectives Forums are regionally focused one-day executive events for senior IT leaders at mid- to large-sized organizations in the private and public sectors. Produced by CIO magazine in partnership with sister organization, the CIO Executive Council, these Forums provide compelling, content-rich networking events where CIOs and senior executives can collaborate on business and technology issues ranging from the impact of local economic conditions to the most pressing national trends affecting IT in the enterprise. The agenda for each CIO Perspectives Forum is designed by a regional advisory board in each event location. These powerful advisory boards, comprised of CIOs from the most respected companies in America, work directly with CIO magazine's event staff to guide and approve the selection of topics for all agenda sessions, interactive workshops, keynotes and featured speakers. The CIO Perspectives Forums empower local CIOs to build sustainable professional communities, determine the most relevant conference content for their region, broaden the scope of their partner/supplier networks and update them on the latest technology solutions and services their businesses require. In this casual, fast-paced session, attendees and participating sponsors will have the opportunity to meet and talk briefly in small-group discussions. Timed for two 15-minute segments focused on top IT and business issues, this networking session delivers a lightning round of ideas, perspectives and new connections for everyone in the room.